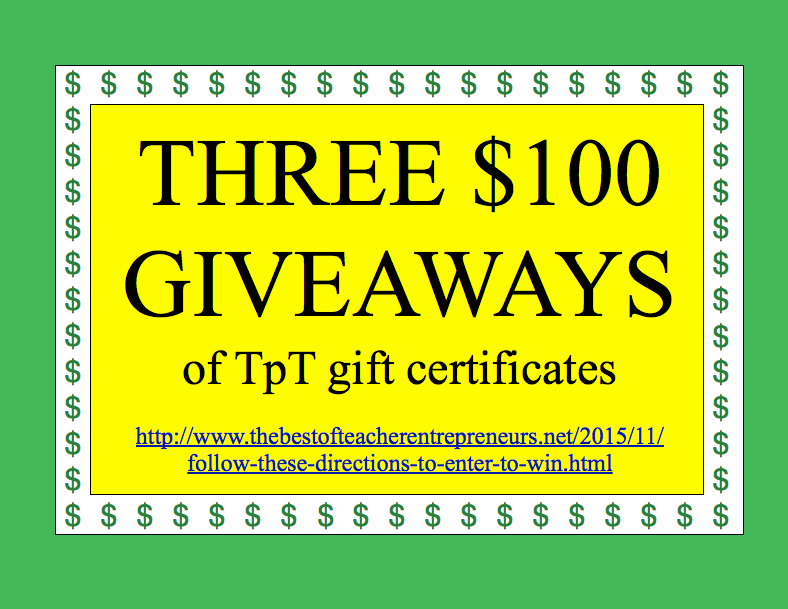 The Best of Teacher Entrepreneurs III: THREE $100 GIVEAWAYS of Teachers Pay Teachers Gift Certificates! Complete the Rafflecopter Contest Application at the bottom of this post to enter to win the FIRST $100 GIVEAWAY of a TpT Gift Certificate. Click on the link, A RAFFLECOPTER GIVEAWAY, located under "BETTER ODDS THAN VEGAS!!! " to earn the raffle ticket entries. (You may have to wait a minute for it to appear on your computer.) 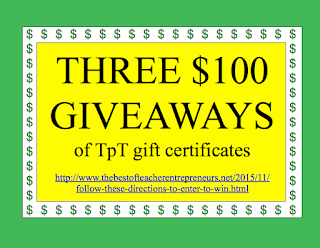 The FIRST $100 GIVEAWAY of a TpT Gift Certificate will end at 11:00 P.M. on December 21, 2015 Pacific Time. All new members and members who have renewed their membership in The Best of Teacher Entrepreneurs Marketing Cooperative from August 8, 2015 - December 28, 2015 at 11:00 P.M. Pacific Time will be entered to win the SECOND $100 TpT Gift Certificate. All members of The Best of Teacher Entrepreneurs Marketing Cooperative will automatically be entered to win the THIRD $100 TpT Gift Certificate on December 28, 2015.